With a name like Killer Meteors I honestly do not know what to think about this movie. The cover of the movie show a minimal idea of what the movie might be about, and not much else. The casting crew were submerge under Jackie himself, and nothing I can say really impress me about this movie in general. One interesting facts to be noticed is that this movie feature Jackie as a villain, even though the star said that he does not play villain on the big screen, and vouch to remain a good-guy, Jackie Chan did sunk his hand into the evil water when he was young and still a struggling stuntman/actor. Mei Xing He is a local hero, as known as “Killer Meteors”, his secret weapon makes him invincible. However, when Hua Wu Bin, another powerful local character seeks his assistance, Mei Xing He will face the deadliest challenge of his life. Just to be clear Jackie did not play the main character nor the main villain in this movie. He played a somewhat minor role in this movie, and only appears for roughly 20 minute of screen time. Nonetheless his character is fairly important to the plot. The storyline is a bit to messy in direction an there are no real build up and structure to the end fight scene like most old kung-fu movie do. Instead we are treated with a lot of lazily choreograph fight scenes, none of which features Jackie Athleticism that we come to love. 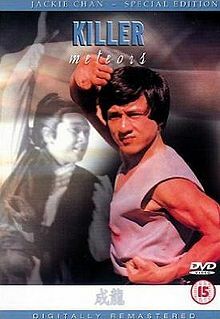 The atmosphere of the movie deliver is plausible in term of a kung-fu movie. however, there are nothing really to latch your eyes upon for long period of time. the movie is kind of like a flat soda, it just die after a few sip.